2013 ~ No, I am not going to get all philosophical. I want to talk about other reflections. Since I take a lot of pictures of wading birds and waterfowl, I have quite a collection of photos with reflections. In fact, I have been trying to add more. Not just water, but buildings and unexpected reflections. It seems to be an interesting venue for photography. One of my recent trips to Brazos Bend resulted in some fine sunrise photos. You can pack up and leave before dawn to get there in time, but that does not ensure getting great sunrise shots. Sometimes the clouds are heavy, sometimes it just gets lighter gradually, but once in a while you get some drama. There were clouds that morning for the sun to peek around. I was standing on the beginning of the pier when I took the shot above. I wanted to get out on the other part of the pier but... it was full of serious fishermen! They had even brought lawn chairs and there were rods set up all over the pier. The guys were nice, but I was afraid I was going to get hooked or be in their way while casting. And by the way, little Grebe above was featured on a collection for Colors of the Week - OrangeWednesday on Instagram. He is the famous! But, I did spy my favorite alligator under the pier. I know this is the same one I photographed last year. I used that image as my desktop for months; I KNOW that face. Snout. Profile. Don't you think he is lurking around under the pier in case he can grab whatever the fishermen bring in? Speaking of the pier, this is what it looks like. It is T-shaped and I am standing on one of the shorter parts looking back toward land. I took the one above last December, all the vegetation had died down and the lake looked so smooth. During the fall, the dead reeds and lily pads made all my shots look so junky. Hard to get reflections with all that. The one above was taken last weekend at Creekfield Lake. 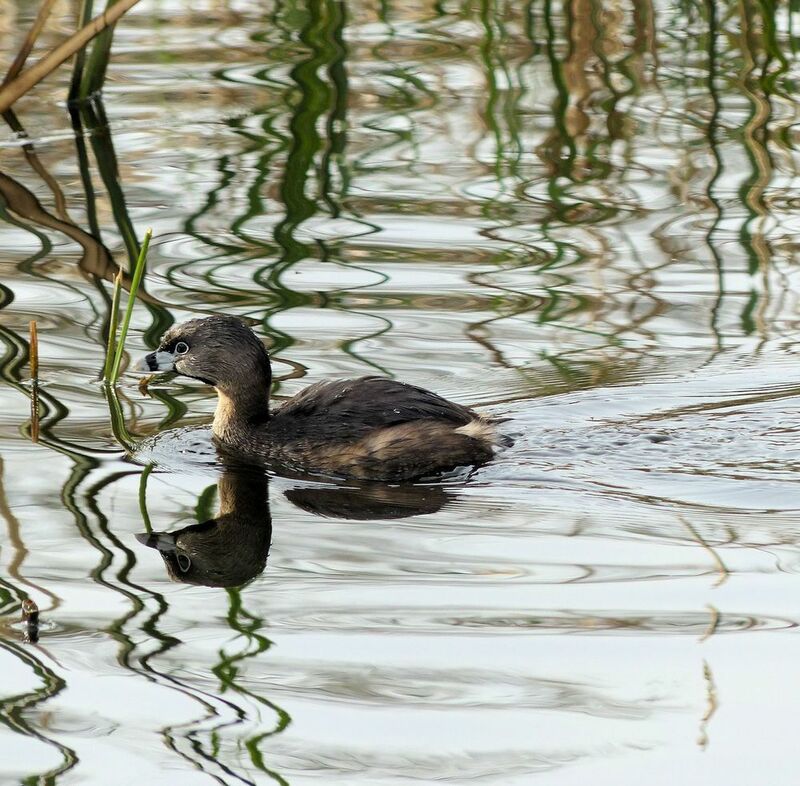 What is it with those Grebes swimming around all alone? This was later in the day and the blue skies and clouds look really nice. And what is this Grebe she keeps talking about? The photo above is the first one I saw, a few weeks back. I had to look it up, I had no idea what it was. Grebes are not ducks. They do a lot of diving, and eat fish and crustaceans and water insects. At one time they were categorized as related to Loons, but that has been disproved by DNA analysis. There are a lot of species, but the only one I have seen is the Pied-billed Grebe shown above. They hang around with Coots and Moorhens. And have lobed feet like the Coots do. I don't think I can get a picture of the Grebe's feet for you because.... because.... their feet are set back so far on their bodies (for all that powerful swimming and diving) that they are all unbalanced on land and fall over! Now, aren't you glad I told you that! 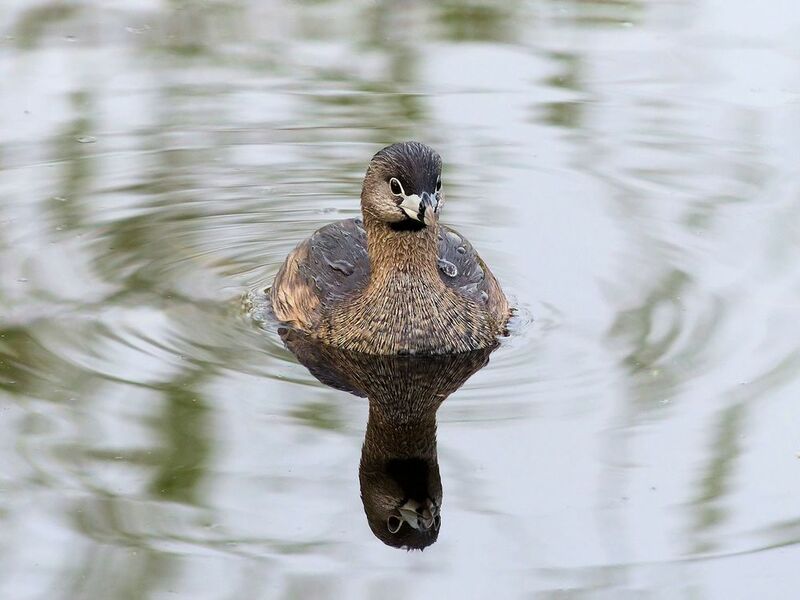 Another Pied-billed Grebe photo. He is just so cute! Here is another shot of a Grebe, or the same Grebe as the one with the reeds taken on a different day. These guys are little, I suspect less that a foot long. They dart around the other waterfowl and seem a bit aggressive. They are fast swimmers and dive for long periods of time, coming up a long ways from where they started. When I started posting these Grebes on Instagram, they were a big hit since others have had a hard time getting clear shots. I think this guy wants to be in the movies. Or a commercial. Maybe he has heard of the Aflack Duck? The lakes at Brazos Bend have afforded me great opportunities for birds and reflections. I have shown you Egrets and Herons before but the water reflects not just birds, but other natural wonders. OK. Before you get all freaked out. I was on a dry trail, this guy was in a small pond about 10 feet away. I used my zoom, I was not that close. But seeing him swimming around in the water reminded me they can be anywhere, anytime. And he was featured on a collection today with two cows, a goose and an alligator. And lots of Instagramers are scared of snakes, I found out. But you don't have to go long distances to find great reflections. I posted that lovely Monet-looking reflection one time before; it is in my Instagram Adventure. The one above is similar to that. A tree all budded out for Spring, and a lamp post reflected in a big puddle. This crow was hanging around in an area where there was a water leak on the next street over. It is fixed now, but it made for a nice photo. Water is not the only place to find reflections. We have multiple glass buildings around town, and you can find some really interesting situations. This was some office complex; I had stopped because I saw a Common Egret in the nearby drainage ditch. And going back to my car I started looking at ... well, that is the way it is with me these days! The above photo is a work in progress. There are two yellow cranes outside my office window putting up a new 20-story building. I have been working on them at lunch and even on the weekends. I have shot them from below, from parking garages, from the street. The reflections are interesting, but I am not completely satisfied. Have you taken photos with reflections? Have you ever taken a picture of yourself in the mirror? Do you look at your reflection when you pass a glass window? Post your comments below. Remember, you can sign in with FB or Google or just use the Guest account and any name you want. None of the other stuff is necessary.